Evoking hilarity and sympathy, the shifting eyes tell the tale in this perfectly paced story in three parts, highlighting Jon Klassen’s visual comedy, deceptive simplicity and deliciously deadpan humour. 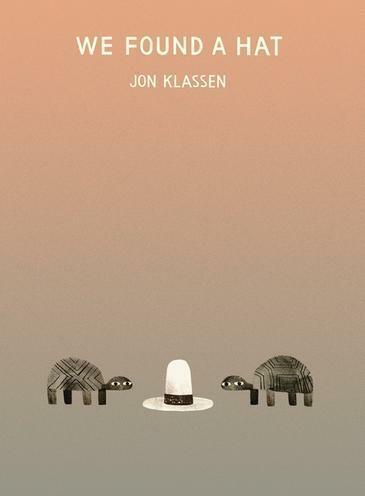 Jon Klassen is back with another hat book! This time two turtles find a hat. And the hat looks good on both of them. But there are two turtles and only one hat. Both turtles agree that it’s only fair to leave the hat. Unlike the first two in the hat trilogy, We Found a Hat has a much happier ending! Despite this, We Found a Hat is still as hilarious and naughty as all Klassen’s hat books. And his simple but effective illustrations meant I couldn’t help but laugh out loud at the shifty eyes of the turtle who is clearly intending to take the hat as soon as the second turtle is asleep. I loved this book, hopefully there are still more Jon Klassen hat books to come but if this really is the last, it’s an excellent one to end on.